Killer Characters: Good Luck To You! Hello. I'm Rory Chasen. As you may know, my stories are featured in the Superstition Mysteries. Not that I set out to solve mysteries, but they seem to appear around me, and I wind up having to help friends by finding the killer. The first, Lost Under A Ladder, was published in October, and the second, Knock On Wood, came out in October of this year. And yes, I've been told that Unlucky Charms, the third, will be published in October of 2016. Do you see a pattern here? In any event, I've been advised that there is a daily giveaway here on Killer Characters during the holiday month of December. 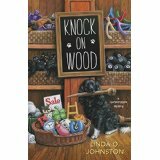 That will include a copy of Knock On Wood to the lucky winner, one of those who leaves a comment on this post. Now, I've done a lot of research on superstitions since moving to Destiny, California. Nearly anything you can think of has a superstition associated with it--and that includes winning! Most of the superstitions I'm familiar with on that topic involve things like picking the right lottery numbers or trying to ensure a win if you're a baseball player. As a result, I can't really tell you how best to win this day's contest here, other than making sure you leave a comment. You can always cross your fingers or knock on wood that you're the winner. But this situation doesn't lend itself to your choosing whether you leave the first comment or exactly which comment slot you select, since they appear in the order sent to post. If you're picking lottery numbers, for example, you might decide to use your favorite race horse's number, or your license plate number, or your birth date, for luck--but that won't work here. One thing you could do is to wear your birthstone while you're commenting and rub the gem for luck. In any event, you can be certain that I, and my lucky dog Pluckie, wish each of you the best of luck. I hope you're the winner! I've been informed that Linda O. Johnston will have her dogs choose the winner randomly from those who leave comments here. Be sure to leave your email address so she can contact you if you're the winner. Rubbing my garnet stone for good luck! Thank you for the giveaway. I have a garnet to rub. I shall fetch it. My birthday's in October.... works for me! Thanks for the giveaway! No birthstone ring here, hope using my diamond will work too! Thanks! I'm an August baby and never thought to rub my peridot for luck but I'll try anything once. Thanks for the hint. My father, husband and son's birthday is in October, hopefully that brings luck! Thanks for the chance! I'll just rub on my wedding band---it has a couple emeralds in it so we'll see if that works. Thanks for the contest. I have had the worst luck this month. Maybe this will change it! Thank you for the chance. I'll feel lucky if I win the book. Thanks for a chance. This series looks fun! I have always been interested in superstitions. Thanks for the chance to win! Funny how sometimes I am superstitious when I don't even realize. Think it was my grandmother's influence, she had it down to a fine art. This is such a fun, quirky series. I love to learn about the superstitions. I'm always wearing my favorite sapphire necklace. Rubbing it while I decide what to say. I didn't even know it was a superstition! My birthstone is Emerald and green is one of my favorite colors. Hope it brings me luck. Merry Christmas. Rubbing my emerald for good luck!!! Thanks for the chance to win and Merry Christmas!! The first book was good, I am sure the second one will be. I love reading about superstitions...I don't actually have my birthstone since I like a very different gem, but I will quite happily rub my sapphires if that helps, lol. Thanks for the giveaway and Happy Holidays! I rubbed my peridot earrings and I'm using a stylus dipped in brown gravy hoping your dogs pick me! Merry Christmas! I haven't read you yet but I would like too...sounds really good. I haven't read this series yet but enjoy your other ones. My birthstone is garnet. I have never had a real one but hope to. I grew up with a Mom from New England so we have many superstitions in our lives that I go by today. Never put any shoe off the floor as it brings bad financial luck. Plant rosemary only by a gate for luck. Never think negative thoughts while you cook. And lots more! Spilled salt must be thrown over your left shoulder. Black eye peas must be eaten on New Years for luck. So many more! Adore your books. That's cute that Linda's dogs will pick the winner. Tell Pluckie hello and to come on down for a swim in the Colorado River. Thanks to all of you for commenting and entering. Fun to see your good luck stones and other superstitions. I'm on the wait list at the library for the book - thanks for the chance to win a copy. Happy Holidays!